An early Merry Christmas to all you readers...a Merry Cajun Christmas, that is. I don't know how it happened but suddenly I have Cajuns coming out the wazoo. You could even say it's CAJUN CRAZY, which is the title of my new book. 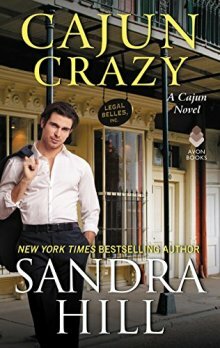 CAJUN CRAZY is the story of Simone LeDeux, an ex-cop and three-times divorcee, who's decided to move back to the Louisiana bayou country, where she will open a Cheaters-type detective agency. The only condition is: No more Cajun men. Good luck with that when she meet s up with rogue lawyer Adam Lanier, who's a player in the courtroom, as well as the bedroom. Toss in the inimitable Tante Lulu and Simone's mother who's developed a fascination with Spanx and her inner Kardashian, and you have a recipe for humor. But that's not all. I recently reissued and retitled SO INTO YOU into BAYOU ANGEL. Lots of times, authors cringe when they go back and read their old books, but I have to say, with shameless pride, that my hero, Angel Sabato, holds up very, very well. And Tante Lulu is at her matchmaking best, or worst, bless her Cajun heart. By the way, don't you love this new cover? And here's the big news...ta da!...finally, I have written Tante Lulu's very own story in a long novella titled WHEN LULU WAS HOT. There may even be a sequel to this some day. Don't forget that THE LOVE POTION, the very first book in this series, is still available new. Oh, another thing. A DIXIE CHRISTMAS anthology is available until the 30th for only 99 cents. Lots of people ask how a Pennsylvania girl like me got interested in Louisiana. I've never lived there, but I swear I have some genetic memory of the South. My family tree gives no clues, except that my grandmother's maiden name was Butler, a well-known, sometimes notorious, southern name. And my grandmother, bless her heart, always claimed she was related to Rhett Buter. I know, I know, Rhett is a fictional character, but you couldn't tell that to my MumMum (Is it a coincidence that we called her MumMum, while the Cajun name for grandmother is MawMaw?) Anyhow, I have been to Louisiana several times, and it was love at first sight, and smell, and taste. Honestly, what women doesn't melt when she hears a man with a slow Southern drawl say, "Hey, darlin'"? From Tante Lulu and all the LeDeux clan down on the bayou, I wish you a very merry Christmas, and may all your Christmas books bring you a smile...and maybe a little sizzle.